On the last Wednesday of each month Plan B Burger in Milford will be holding a cocktail competition and you get to be the judge! Starting this Wednesday, February 27th from 9-11 pm you can enter to be a judge of creative cocktails concocted by the staff. 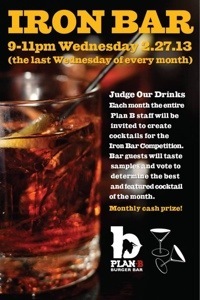 Bar guests who sign up to participate as judges and cast their vote will be eligible for a chance to win a cash prize. The drink which wins the competition will be featured as the cocktail of the month. For more details please check out Plan B Milford’s Facebook page.